Packers players started to move their personal belongings into the dorms at St. Norbert College in De Pere Wednesday afternoon. A tradition started under Packers coach Scooter McLean in 1958, the Green Bay Packers will call the college home for a 56th consecutive training camp this summer. Watch the video below to see what RB Eddie Lacy and DE C.J. Wilson had to say about training camp and life in the dorms. Depending on the post-practice update from Mike McCarthy, the Packers could be a little thin on the defensive line for Sunday’s showdown against the Vikings and RB Adrian Peterson. DL Ryan Pickett and C.J. Wilson were both sitting out practice on Wednesday during the portion of the workout open to reporters. Pickett will be new to the injury list when it is released after practice. 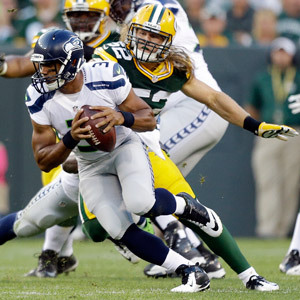 Wilson left Sunday night’s game against the Giants with a knee injury. Also, WR Donald Driver was not practicing. Driver has been on the injury report with a thumb injury, but he hasn’t missed any games. Backup RB Johnny White, who left Sunday’s game with a concussion, also did not practice. Continuing to sit out on defense were DB Charles Woodson, CB Sam Shields and LB Clay Matthews.